To admin a page you have to click on the new page titleÂ (in the example below the title isÂ "newÂ page") so you will enter to contents page administration. 'Editor allows you to create texts, images, flash, youtube video, attach a file, creating tabs. Attention: clicking on this icon the content of the present pageÂ will be delated. Paste the text in the editor without cleaningÂ it up of any HTML elements. The characters will be imported as they are, without being "confermed" to the standard site. This sequence is rarely used because it isÂ not recognizedÂ the standard site formatting. Therefore, it is recommended to use next button: paste from word. When you copy a text from word, it is possible that the settings will be incompatible with editor, so the text will not respond to the formatting commands. This sequence allows you to paste a text into editor through a filter. This clean the text up of any "dirty" HTML code. The characters will beÂ "confermed" to the standard site. Find a word in the text. It allows you toÂ "find and replace". With mouse cooshe the space where you want to insert the image, click onÂ Â icon. Now a windowÂ calledÂ âImage PropertiesâÂ will appear youÂ . Perform the procedure already described inÂ GRAPHIC LOGOÂ section. The system shows you the miniature image in "Image Properties"Â section. You can choose the width and theÂ height, the border (Set 0 if you want a phot withount border).You also can set the image alighment in the web page or in a table. Double-click on the uploaded image, so you will see the miniture image in "Image properties" window. Â ATTENTION:Â You can upload more file simultaneously. OurÂ editor allows theÂ MULTI-UPLOAD. You need to select,Â from your PC,Â files you want to upload and proceed as follows. Click on "LINK"; Click on "SEARCH ON SERVER"; select the folder which contains the image; double-click on original image; you will be on "image properies" window; select "target"; chooseÂ âNew windows (Blank)â option; click OK. If the procedure was successful, click on minimized photo, it will appear the photo with original size. If you want to change destination (e.g. POPUP opening) position the mouse pointer above the imageÂ (in editor) and set the "destination". Choose the space where insert the table, click onÂ , a "Table Properties" window will appear. Each image was insert into table cell minimizing them. The image were insert intoÂ 1Â° andÂ 3Â° row, so the 2Â° andÂ 4Â° were empy to write the captions. If you do not desire border set the value as 0. Each image was reduced to icon, so you clicking on icon you will see the original foto. In this case we have created a custom phototogallery. To each image you can add texts, file, link, make them ipertextual. 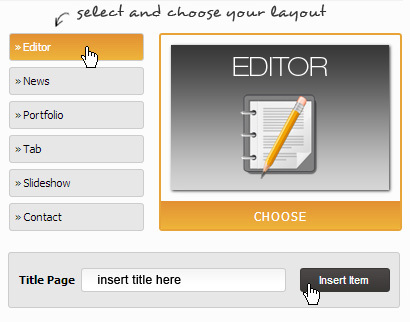 To add o to delete detailsÂ and to align the content to individual cell, click withÂ right mouse button. You can controll the table properties, the rows, columns and cells. It allows the insertion of special characters, e.g. $,Â &,Â Â©,Â Â®, etc. You can link internal and externalÂ texts or images to website. Supposing that you want to link them (already present in the site) to a google map. Â Firstly on google map make sure the exact adress; copy the link generated by google map (right mouse button + copy). Selct the text or image your make it interactive (when clicking on it the server takes you to google map), go to Â icon, a "link" will appear you. In âURLâ text fieldÂ (side toÂ protocol) Â paste the link previously copiedÂ to google map. Destination:Â select new windows destinationÂ (blank) or a popoup window.Â (theâdestinationâ allows your site remains opened when the browser closes the linked page). You can link texts and images to an e-mail adressl. Proceed as the precedent paragraph, except in "type of link" you have to selectÂ âe-mailâ. You can link texts and images to fileÂ (PDF, images) containded in the server.Â Select the text or image you want to make interactive, go toÂ Â icon. Now a "link" window will appear you. Upload:Â with the browse button select the file from your pc and confirm with "opern" button. Go toÂ "send to theÂ Serverâ. ClickÂ ok (If you want to open the file in popoup, you have to set in "destination" popÂ up). It allows you to delete an existing link. Go over the link word or image and click on Â icon. After creating a page with lots of text,may be useful to divide it into sections (paragraph or charper) or create an index on the top of the page. After creating the index, go on the part text you want to link to index and click onÂ Â icon Â . Give a name to anchor: for example "title 1" and click ok.
From "link information" select "achor". Now a window will appear. It allows you to choose which Achor link to "title 1". Complete the procedure and save.Â Â From now, when you click onÂ âtitleÂ 1â on the index, the servertake automatically you in the corresponding text; This operation is called hypertext. Control the number list settings and bulleted list. It allows to insert a "citation" or a paragraph to point out the text. The formats accepted by editor are: 7z, 3gp, aiff, asf, avi, csv, doc, docx, fla, gz, gzip, mid, mov, mp3, mp4, mpc, mpeg, mpg, ods, odt, pdf, ppt, pptx, pxd, qt, am, rar, rm, rmi, rmvb, rtf, sdc, sitd, sxc, sxw, tar, tgz, txt, vsd, wav, wma, wmv, xls, xlsx, zip, bmp, gif, jpeg, jpg, png, tif, tiff, swf, flv. Webee allows to insert an youtubeÂ video in widgetÂ .Â Â So you can view it in each page, where the widget are active.Â If you want to insert more different videoÂ awe suggest you to create one or more specific editor page and to follow the direction below. CopyÂ (right mouse button) the code destined to be insert in yourÂ editor. Go to editor page and select "Source"Â (step 1), then pasteÂ the code copied fromÂ (step 2). You can insert as many video you tube as you want,Â in vertical sequence. After pasting the code you have to save to confirm the changes. Clicking on "preview" you will display the editor page with video (the video size will be the originalÂ Â from you tube). To each page you can insert an imageÂ slider. To manage the page slider you have to click on SLIDER OPTIONSÂ on the top of control panel. To confirm the changes click on SAVE button. If you click the button on the left of the slide, a panel will appear on the right side.Â It allows you to upload the image (through the BROWSE SERVER button). You can set aÂ link and an ALT toÂ image. You can also write a text in the browser if this will be active(ON status). If you want to delete the image, click on DELETEÂ button.